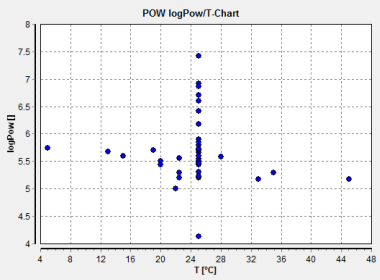 The POWDDB data bank stores octanol-water partition coefficients (POW). Based on these data, a special POW-UNIFAC (Wienke, 1993) has been developed. As an example, the experimental octanol-water distribution coefficients for hexachlorobenzene as function of temperature are shown on the right hand side. At 25°C the data cover a range of nearly 3.5 orders of magnitude. Numerous publications reporting this value come from sources with limited experience in the field of experimental determination of thermophysical properties and were published in journals focusing on environmental science. It is therefore of great importance to have a large database available and not rely on limited information from only a single reference. The DDB online search can show a list of components for which octanol-water partition coefficients are available.